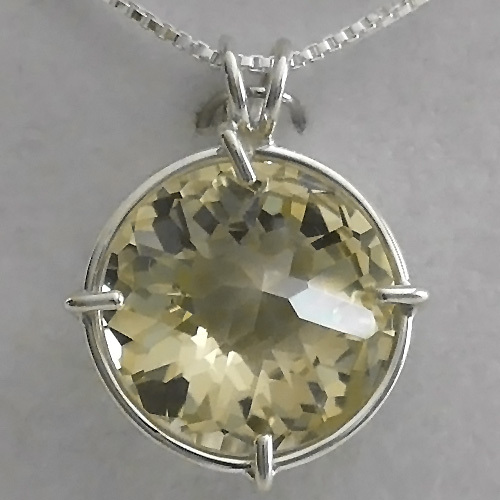 This light filled Golden Labradorite Radiant Heart Pendant is a translucent beauty. It is set into a sterling silver setting which allows the stone to breath, and hangs on its sterling silver chain right on the thymus between the throat and the heart chakras, offering protection to the whole body resonating through the compassionate heart. We often recommend that our Reiki and past life therapy clients wear crystals or gemstones for protection, especially clear quartz which contains all colors of the spectrum and works on all the bodies: physical, mental and emotional. This Golden Labradorite can work on all of the chakras too, but will most keenly be felt to work on the crown, third eye and heart chakras. The Radiant Heart pendant is a powerful design from the creators of the Flower of Life and Magician Stone pendants, who call it an "evolutionary tool to assist us in expanding our ability to hold and create Unconditional Love, so that we too may 'crystallize' the wisdom of the One Heart that unites all life in Love." 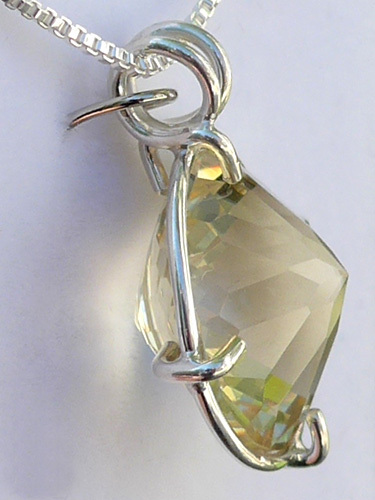 See side view of this pendant below right. Golden Labradorite is said by crystal healers to promote clarity of vision, both inner and outer, to enhance analytical faculties, and to cleans, purify, strengthen and open the third chakra. The third chakra is called the Manipura chakra in Sanskrit, is located above the navel, and is connected to the solar plexus in the physical body. An open, healthy Manipura chakra is likened by yogis to a radiant sun, and is a storehouse of the individual's prana, or chi energy. The Manipura chakra is related to issues of empowerment, will, and the ability to manifest one's intentions in the world. A healthy Manipura chakra instills qualities of courage, right action, leadership, self-worth, self-respect, inner radiance, and self-worth. Golden Labradorite also works to open and energize the crown chakra. In the Western chakra system, the colors gold, violet and white are associated with the crown chakra. Gold is considered the color of Christ Consciousness and clairvoyants report seeing a preponderance of the color gold in the auric field of Adepts and Spiritual Teachers. Note: Weight above is shipping weight. Actual weight of this pendant is 7 grams. Each piece is unique and may vary slightly in appearance. Each piece is guaranteed to be beautiful and to meet with your complete satisfaction!